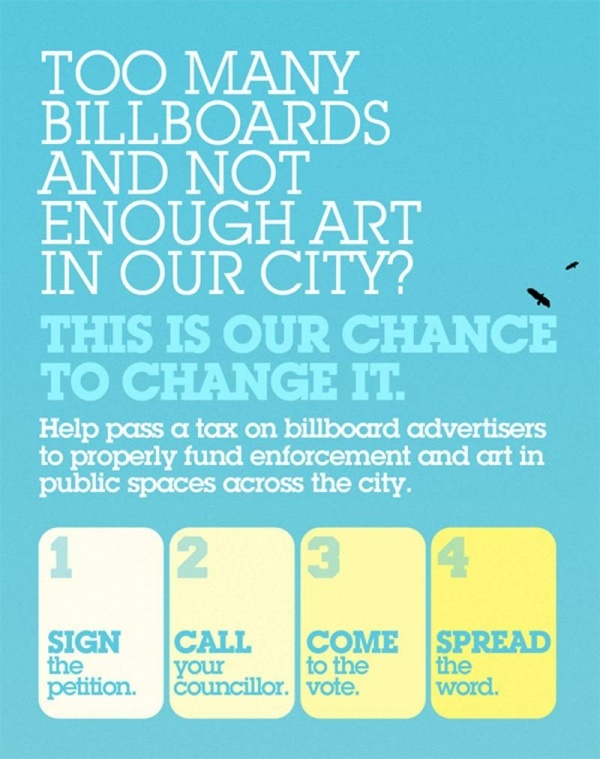 Toronto’s Beautiful City is calling on all Torontonians, and art lovers at large, to get behind the Billboard Tax For Art. The idea is that we should all stand behind the initiative to tax billboard advertisers to properly fund enforcement and art in public spaces across the ‘Big Smoke’. It’s a simple process that, with your help, will have exponential affects on the way the City of Toronto looks in the future. 1. Call and write your councillor. Let them know that the revenue should not be hijacked or pushed down to nothing. Click here for info and key asks. 2. Show your support at City Hall on Nov 30th / Dec 1st RSVP here. Great Proposition, we should get something started here in the states.